have many pen & micro lights to choose from. 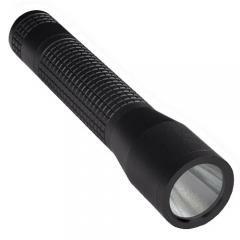 The INOVA T2 is a compact high performance, hand-held sized LED flashlight, small enough to fit in a uniform pocket, but powerful enough to shoot a beam up to a far-reaching 528 feet. Powered by 2-123A lithium batteries, the T2 has a patented optical system that provides thermal management, while harnessing and projecting a powerfully bright (271 lumens) uniform focused spot with flood beam. Engineered with the professional in mind, the T2 has a patented tactical end-cap switch that activates constant and momentary High, Low, Strobe, and Lockout modes. It has a precision machined, aluminum body from solid bar stock with a military-spec Type III hard coat anodized black finish and an aggressive knurling pattern for positive grip. The T2 is a confidence-inspiring tool to carry on duty everywhere. Patented optical system - machined aluminum reflector for optimal thermal management and beam projection.